Providence Country Club was established in 1989 and has become one of Charlotte’s premier country clubs and event venues. The spacious Carolina Ballroom provides an elegant setting for private parties, business meetings and member events. Should you choose Providence Country Club as the site for your special function, you may rest assured that our staff will be available to help you every step of the way. We want you to have a memorable experience that not only meets but exceeds your expectations! The elegance and versatility at Providence provides the perfect setting for your wedding. The Food & Beverage team is eager to meet and exceed your every expectation thus providing impeccable service and fine menu selections. Our team is committed to excellence in their professionalism, creativity, dedication, consistency and attention to detail. We understand that your wedding requires absolute attention in planning and coordination; this is where we provide our unique services to ensure the success of your special day. Please rest assured that once you choose Providence Country Club for your wedding, it will be seamlessly orchestrated. Providence country club Offers multiple wedding packages: • Premier Wedding Package • Extraordinaire Wedding Package • Ceremony Package Please refer our attachment for complete details of Wedding Packages. 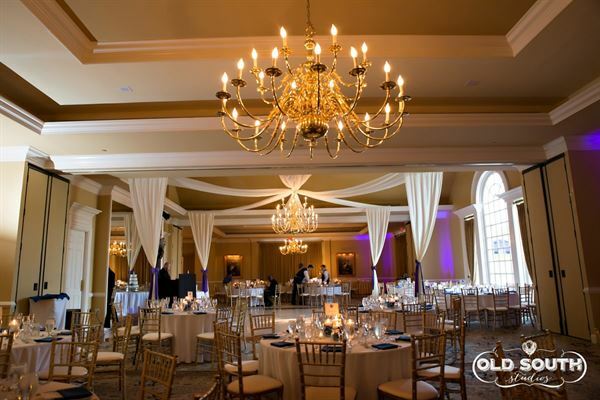 Comprising of over 4400 square feet in total, the Carolina Ballroom measures 127 feet long by 35 feet wide. It features a wrap-around veranda accessed by four sets of french doors, which overlooks the golf course. There is a built-in 25 by 25-foot marble dance floor. Diverse room setups can be done to facilitate the style of your reception; two of the most common accommodate 222 guests and 162 guests. Each includes five-foot round tables for guests, a sweetheart table and a cake table.